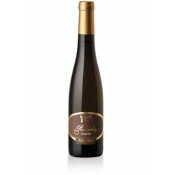 This great dessert wine comes from a careful selection of Arneis grapes. The vineyards are located in the municipality of Castellinaldo. These vineyards have been named "fossil site" since when the operations of plowing the land were made, marls layers fossils of leaves, fish and larvae of dragonflies were found. The vineyards exposure is East, South-east at an altitude of 250 meters above sea level. The training system is Guyot pruning. There are about 4500 vines per hectare. The production is about 0.5 kg of grapes per vine. In some areas of the vineyard the plants grow hard, the soil gives weak vigor to the plants that naturally produce few bunches. The soil to a depth of 2-3 meters consists of finely laminated white marl mixed with more disintegrated sandy soil. The time of harvest varies depending on the autumn weather, the first step to harvest the grapes, already attacked by botrytis noble, is carried out in the first days of November, continuing on several occasions for 15-20 days. The grapes are harvested in crates and the clusters are arranged next to one another to complete the drying process. Following the pressing of the grapes, and therefore the natural settling of the must, the wine is fermented in small oak barrels and refines for about 12 months. The color is a gold glittering yellow. The nose is full, with hints of pear, apple, honey, apricot and dried figs. The correspondence taste and scent is remarkable. 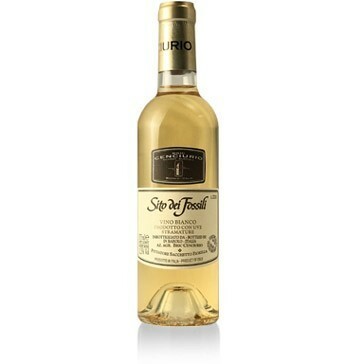 It is sweet and soft, with good freshness and slight sour notes. It has great balance and elegance. In the mouth is persistent with hints of vanilla, tobacco and licorice. Bric Cenciurio is located in the heart of the Langhe hills in the village of Barolo. The company takes its name from the place-name of hill’s strip in the municipality of Castellinaldo: "Bric Cenciurio " that means top of the hill named Cenciurio. Bric Cenciurio company was born at the beginning of the nineties by the idea of Franco Pittatore and his brother-in-law Carlo that decide to join the lands of their families and to make wine. Currently the company is run by Alessandro and Alberto Pittatore and their uncle Carlo with the collaboration of the winemaker Gianfranco Cordero. The vineyard area is about 15 hectares located in 3 areas: Barolo, Castellinaldo and Magliano Alfieri. The company has always been committed to reduce the use of synthetic chemicals substances in the vineyards, keeping alive the good agricultural practices learned from parents and grandparents. Alberto and Alessandro personally take care of all the details and work in the vineyard and in the cellar, perhaps with some extra effort, but with the belief that wine and grape products are alive and constantly evolving, therefore, must be respected and the ecosystem must be preserved intact. Excellent with pastries, foie gras, cheese and chocolate. It should be served at 13-15 degrees centigrade. The perfect glass is crystal clear, smooth and colorless. If properly stored, it can age 15-20 years. The bottles should be stored horizontally in cool, humid and dark place.